Mars and Jupiter conjunct in Scorpio (January 7 – January 17) indicates strong actions will occur, possibly even warlike or defensive actions with regard to the distribution and management of large sums of wealth and revenue. Mars represents action as it occurs, while Jupiter symbolizes expansion and matters of skill building, investing, joviality, vision quests and achievement. This could be a time of exceedingly active breakthroughs with great wins or losses in economic endeavors. Last Quarter Moon in Libra on January 8 reminds us of the need to continue working on the imbalances in our relationships. This is the time to let the emotional pressure be released, and to handle matters with friends and loved ones carefully and congenially. The Last Quarter Moon aspect confirms the need to make amends with others and unite peacefully. Venus in Capricorn sextile Jupiter in Scorpio (January 8 – January 12) is an excellent time to shower loved ones with gifts and compliments. A lovers’ getaway may be just the ticket to recapture some romance. This is the time to allow expansion to occur in love matters and to take the next step towards enlivening and enhancing life. Mars in Scorpio sextile Pluto in Capricorn (January 8 –January 16) is a superb time to take up activities with people of a different culture, or with someone who is of a different level of maturity or experiences. This is also potentially a good time to reconcile differences. Mars is the planet of action while Pluto is the planet of the generations. The activities of Mars sextile Pluto will teach us about hardships and what we can learn from other generations. Venus and Pluto conjunct in Capricorn (January 9 – January 17) often places affections and love right where they are needed most: the areas of life that are deeply challenging and sometimes traumatic. This is a time when the intensity or hardship of love and attraction create richly striking images and perspectives which we must eventually let go completely in the hope that love and beauty will transform our lives once again. Venus in Capricorn sextile Mars in Scorpio (January 9 – January 16) promotes mischievous, talkative and outgoing kinds of affection. Feminine (Venus) and masculine (Mars) forces have an opportunity (the sextile aspect) to support each other. The Mars influence emphasizes the awareness and application of action, movement, involvement and also harnesses strength and energy. Venus reminds us to draw towards ourselves the pleasures we desire. Here we have the incentive to apply action with love. Mercury enters Capricorn (January 11 – January 30). While Mercury travels through Capricorn, communications tend to be more serious and to the point, although not necessarily less complex. Our realms of communications have a determined and persistent quality of expression, like a demanding voice waiting to be heard and received with hospitality. This fits with the solar days of Capricorn, when the harsh realities of winter demand clarity of purpose in our communications. Communication is one of the tools of survival, and this is an important time to use those skills wisely and sensibly. Mercury and Saturn conjunct in Capricorn (January 13 – January 19) will bring talk about the need to put an end to the useless or unwanted components of our lives. It will focus our thoughts on the areas of life that have reached limitations, or where timely new beginnings – or endings – are occurring. Overall, Mercury conjunct Saturn tends to bring out a strong tone of seriousness in communications. It’s a serious intent to get the word across in no uncertain terms. Taurus: The adventurous theme continues, so if you feel you’re being stretched in some way, then all is well and good. If you’re learning something new, treading uncharted territory, entertaining new ideas, or sometimes feeling a little wobbly as you go a little bit faster than you’re used to, then all is well and good. The universe seems intent on pushing you so that you can grow and see the world from an enlarged perspective. And if you find that what you once believed to be true no longer seems to hold up, that’s good too. Gemini: With the majority of planets crammed into your zone of transformation, work, and health, this is likely to be an intense week. There may be much to do, and if you can pace yourself, you’re more likely to end the week in good shape, but if you overdo it and don’t pay attention to your body’s call for rest and nurturing (which you may feel unable to do if demands on you are very high), then something will likely give. If you are forced to confront your demons or have no option but to rest, remind yourself that the purpose of the current planetary transits is to encourage you to shed your old skin. Such a process requires quiet time, inner contemplation and a willingness to let go. While life may be intense, it’s also preparing for an important rebirth. Cancer: The relationship theme continues as Mercury joins Saturn in your partnership zone. This suggests that serious thought needs to be given to a partnership, perhaps pertaining to a discussion of a commitment or to firm up whatever plans that will enable things to progress. However, it’s not all serious, because the Sun and Venus remind you of the importance of enjoying your interactions with others so this is a great week to cultivate both business and personal relationships. Leo: Work and health are closely tied. If we’re not happy in our work, our health often suffers. A lack of purpose will most likely manifest eventually as a lack of energy or depression, and too much stress or working too hard puts a strain on the body, resulting in illness. With so much planetary energy in this region of your chart, it would seem that these two areas of your life need balance. Perhaps you need to make a change. Perhaps you need to find more joy in how you spend your days, or maybe you need to have a serious conversation with someone about your working life. Finding the right path is important now, and don’t be surprised if your home and family are calling, since you would benefit from devoting more time to them. Virgo: If we want to succeed in anything, we first have to make a commitment to it. This means prioritizing time for it, protecting it with boundaries, and maintaining a serious attitude about its development. This sometimes means saying no to intrusions or other “opportunities” that might tempt you away from what really matters. This week you need to seriously commit to something close to your heart – a hobby that’s important for your well-being, a creative idea, or an artistic dream. Whatever it is, you need to value it enough to make sure that other people at least respect your right to follow it. Show them (and yourself) that you mean business by saying, “This is what I want to do,” and then doing it. Libra: With five planets gathered at the base of your chart, you could be forgiven for not racing out into the world and setting it alight with your energy, ambition and enthusiasm. It is more likely that you’ll feel inclined to curl up at home, snuggled in blankets and finding solace in warm cups of tea and homemade delights. This is the ideal, of course, but the reality is likely to be a mix of cozy bliss and some responsibilities that you’d rather do without. This could be jobs around the home, a family member needing more of your time, or a growing need for introspection. You’re in the process of experiencing some kind of transformation in your private life. This is all as it should be, and while these are favorable days for manifesting money and earning a living, ultimately you need to be where you feel most comfortable. Scorpio: As five planets line up in your mental zone, it’s vital to consider where your attitude is and how it will shape your outcomes. There are the Sun and Venus – joyous, happy and optimistic – and Saturn and Pluto, the miserable heavyweights. Mercury is the referee. It is up to you who will come out on top and dictate the flow of your life. Be mindful of gloomy or critical thoughts, and be watchful of dark moments. Cultivate the bright, sunny thoughts of gratitude, hope, peace and love. If you can do this, you will find that Saturn and Pluto add ballast and structure to your optimism instead of being forces for self-destruction. This is likely to be a very busy week, and if you don’t want to meet yourself coming backward, make time for mindful moments and slow the pace of life whenever possible. Sagittarius: It appears that serious thought needs to be given to your situation, but serious thought doesn’t mean pessimistic thought, which could easily happen this week. Rather, aim for constructive, practical thinking, the kind of thinking that finds solutions to problems and carefully considers how to make the best of the situation. It may be that a few small changes could create a workable solution. Those changes might involve looking at how to spend less, earn more, or save more. It might mean looking at what you really need and letting go of the rest. It isn’t all serious, though. 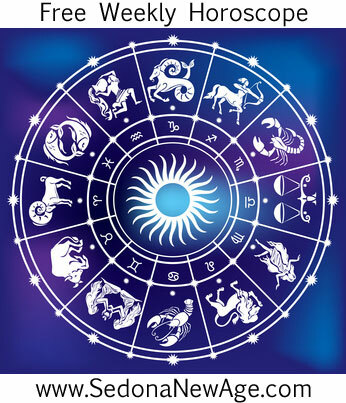 The Sun and Venus offer much hope and positivity in the region of your fiancés and work, so maybe what’s required is blending practical and constructive thoughts and actions with an optimistic confidence that draws good things to you. Capricorn: With Saturn and Mercury in your sign, fast results or great eureka-like moments of insight are not likely. What will be forthcoming, though, is a steadfast resolution that will see you through any wobbly bits, doubts and fears, especially if you listen to your heart, which will speak to you loudly this week through feelings and impulses. Ultimately, the challenge for this week is to make an authentic choice or decision based on what feels right in your heart. Aquarius: If we don’t get a handle on our fears, our fears will get a handle on us. This observation was recently highlighted when an artist friend told me the story of when his grandfather took him to the circus when he was four years old. They sat in front row seats and when the elephant came too close, it terrified the boy. Afterwards, he began wetting the bed. His grandfather suggested that he draw the elephant and gave him a piece of chalk. The young artist rose to the challenge and made a huge drawing of the elephant. In the process, he exorcised his fear and never wet the bed again. Whether you choose to draw, write about or talk out your fear, just get it out. In so doing you will find that it ceases to have power over you and you can channel the energy that was used to worry or suppress into something much more creative and constructive. Pisces: There is still a strong adventurous theme to your chart, so you would benefit from continuing to push beyond your comfort zone and exploring new opportunities and avenues. Keep in mind the need for growth, and embrace any opportunity that allows you to expand and develop. At the same time, your attention is very much on the future, which fits nicely with the adventurous energies, so it is more likely that you will refuse to play it safe where your future is concerned and will take the less explored road. This is exactly how it should be, but remember that a little prudence will be helpful, as Mercury and Saturn in your future zone impress the importance of some sort of plan, structure, or foundation for your dreams. If you can fuse your growing optimism, hope and adventurous spirit with practical application, you may very well find yourself in an extremely enviable position. Sun 01° Taurus 41' 40"
Moon 05° Sagittarius 58' 38"
Mercury 06° Aries 19' 51"
Mars 14° Gemini 22' 53"